Shhh! You’re in the library! As the great-granddaughter of a librarian, I was brought up to know that the quiet of the library was sacred space. Fast-forward 30 years. In the media centers of the Cherokee County, Georgia schools, where I train as an instructional technology specialist, quiet is no longer the chief value. Instead, makerspaces are bringing books to life, and the new mantra is, "Innovate, create, collaborate." Many media specialists still struggle with this transformation from silent reading space to innovative makerspace; with that in mind, I interviewed six women who seamlessly flow from rockin’ librarians to Creative Directors of Making in the same day to ask how they do it. We all need more money, more space, and more time. The public school is all too aware of these inadequacies. So how have media specialists overcome these gaps? Indian Knoll Elementary School’s Jennifer Lewis struggles with the time factor; her students are mostly able to come to the "make room" during recess, so projects have to be organized and fast. For her little ones, she groups the materials into kits that students may check out after they attend a mini-class for training. Leslie Hicks and Pati Olton of Woodstock High School crowdsource materials for their students to upcycle. 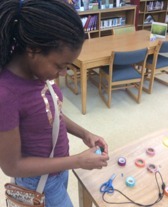 After a year of ordering materials with limited library money, they realized that students were more likely to participate in crafty upcycling than what they had spent the funds on anyway. Just making is not enough -- the media center’s main focus still has to be to support engagement with the curriculum. At Ballground Elementary School, Anne Nechvatal uses making to connect to narrative nonfiction picture books. For example, students read Pippo the Fool and created their own gumdrop domes. The nonfiction text they must read to prepare for standardized testing becomes engaging when coupled with making. Woodstock Middle School’s Wendy Cope agrees the focus has to be not just on crafting but on innovation and design. Projects should be student-driven and challenging; when students can present their designs, like in WMS’ Maker Faire, they naturally take the design more seriously as well. It may be easy enough to get elementary-schoolers involved in making, but what about teenagers? They can seem apathetic about the very activities adults find engaging. Keara Rubin of River Ridge High School recommends leaving maker stations up for a whole week, which allows for more creativity. Involving a student leader can help with managing these areas. Etowah High School’s Cari Cain and Denise Lewis not only leave their stations up but dedicate areas on the tables to different lunch periods. This setup enables competitions and the display of finished examples for others who may join the making later in the week. It was so much fun seeing the excitement of all these proud media center parents as they shared the triumphs, trials, and tips of creating a makerspace. Most of them have just started the process of the transformation, so what would they say to other media specialists just joining the journey themselves? Don’t make it a competition. Your makerspace doesn’t have to look like anyone else’s. Keep it free or cheap. Involve your PTSA, your Facebook friends, and your faculty in donating items that will make the space come alive. Pinterest is the place! Even if you’re more of a bookworm than a creative type, you can jump on board easily once you see the amazing ideas that are already created for you. Ask for grant money. If you’ve never written a grant, it’s worth it to help you create curriculum-connected making that integrates with your library programs. Advertise and train. Many students are unaware of this maker movement that’s starting in their media centers. Provide lunch and learn sessions and advertise on the morning news; students who are excited will be your biggest referral source, too. 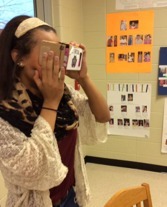 Cherokee County’s technology integration is second-to-none. Check out all these great media center makerspaces by clicking each linked school above or following me on Twitter @lolleytchr. MAKE it great! Feature photo courtesy of Allison Shelley/The Verbatim Agency for American Education: Images of Teachers and Students in Action.